Custody, Care and Control, and Access to children form part of the ancillary matters to be decided after an interim judgment of divorce has been granted. During divorce proceedings, parties are required to submit a proposed parenting plan, which would detail what they each would want with regards to custody, access and care and control of the children of the marriage. If there is an agreement between the parties regarding the parenting plan, the Courts will generally adhere to it. However, if there are disputes, the court will try and mediate between the parties and make a decision that is to the best interests of the children. This is called the ‘welfare principle’, where the Courts have the duty whereby the paramount consideration shall be the welfare of the child. In reaching the decision, the court will have regard to the wishes of the parents, and the wishes of the child, or children, if they are able to express an independent opinion. 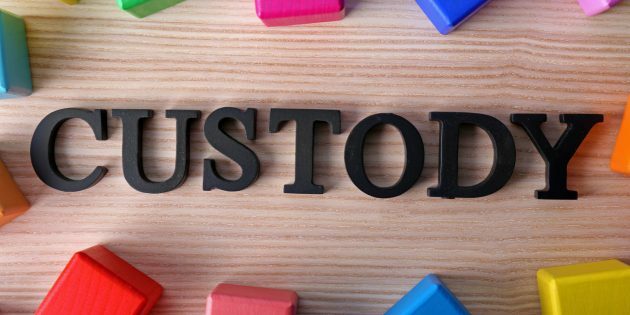 What exactly is Custody of a Child in Singapore? The person having custody of a child possesses authority in making major decisions regarding the child. The Women’s Charter provides that major decisions include all questions of education and general upbringing of the children. If a sole custody order is awarded, the custodial parent does not not need to consult or obtain permission from the other parent in making such decisions. In a joint custody order however, both parents have to agree on such decisions to be made for the children. What exactly is Care and Control of a Child in Singapore? Care and Control would determine who the child lives with. This means that the party would be in charge of the day-to-day affairs of the child and making decisions to give effect to that. Typically, Care and Control is given to one parent. Children who are subjected to a Custody or Care and Control are not allowed to be taken out of Singapore unless both parents have given their written consent or the leave of the Court. However, Section 126(4) of the Women’s Charter stipulates that the parent awarded custody, or Care and Control of the children is not prevented from taking the children out of Singapore for a period of less than one month. The parent holding Custody or Care and Control of the children is allowed to give consent, in writing for the children to be taken out of Singapore for a period of less than a month. What exactly is Access to a Child in Singapore? Access to a child is given to a parent who does not have custody or care and control of the child, so that that parent can spend time with the children. It is a right the other parent has as a result of the order. The order would stipulate the frequency of access the other parent has to the children, and the extent of the access. How does the Court decide on Custody, Access, and Care and Control of a Child in Singapore? In deciding on Custody, and Care and Control, the paramount consideration for the Court, as stipulated in Section 5 of the Women’s Charter, is the welfare of the child. To achieve this outcome, the Court is also under the duty to have regard to the wishes of the parents, and the wishes of the children (if they are of age to express an independent opinion). The quantum of access would be one that is reasonable to the Courts. What are Common Orders Given by the Court on Custody, Access, and Care and Control of a Child? Hybrid order: This type of order is similar to a sole custody order, but it has certain conditions attached to it. Conditions such as the need to consult, or agree upon with the other parent regarding major decisions on specified matters such as education, residence or religion. Split custody order: This type of order is relevant in the case of siblings. A split custody order would separate the siblings between the parents. However, such an order is unlikely as the courts are more inclined for siblings to live together. Usually, the Court would award Care and Control to only one party, rather than shared Care and Control. Shared Care and Control would require a 50-50 split in time between the parents, which is inconvenient considering the commute between two houses, especially for children still in school. Furthermore, this might be disruptive to the children, which goes against the welfare principle the courts adhere to. It should be noted that the Singapore Courts mostly award Care and Control to mothers rather than to fathers. This stems from the fact that the Singapore Courts emphasizes on the maternal bond and the nurturing role women play in a household. While it is difficult for fathers to obtain care and control of the children, it is not impossible, especially in cases where the mother is abusive, or the children express their desire to stay with their father instead. Access will normally stipulate arrangements for the parent not holding Custody, or Care and Control of the children to spend time with the children. For example, access can stipulate weekly meetings at fixed timings, or set out school holiday schedules if the other parent would like to spend extended amounts of time with the children during school holidays. The order can also dictate the location of access, whether they are visitations, or outings. The Court has a wide discretion to awarding Custody and Care and Control orders. Under Section 126 of the Women’s Charter the Court has power to include certain conditions in Custody and Care and Control orders. Orders can be subject to conditions relating to where the child should reside, the religion the child is to be brought up, as well as other conditions the court may think fit to impose. Generally, in uncontested divorce proceedings, the parties come to a consensus on Custody and Care and Control of the children between themselves, or with the advice of legal counsel. While splitting hairs over who should get care and control and how the other party will have access to the children can still be a frustrating process, settling things between yourselves lends itself to a more harmonious breakup (if such a thing even exists). Civility (though easier said than done) between the parties generally leads to a better post-divorce environment for the children and amicable, uncontested proceedings generally lead to less acrimony between the parents afterwards. Not to mention the fact that it’s also a lot cheaper. 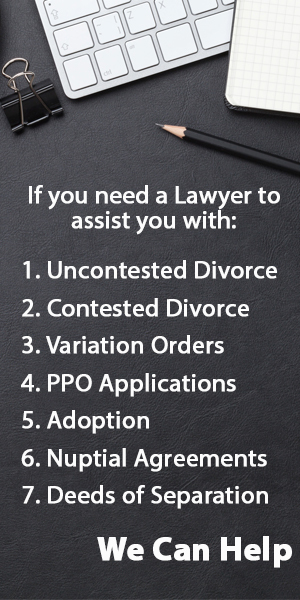 In contested divorce proceedings, lawyers will usually be engaged to battle over who gets custody, care and control, and access. In such situations, there are usually certain technical aspects of the law where a good divorce lawyer can assist with. Do you need assistance with Custody, Care and Control or Access issues in Singapore? Regardless of whether you're looking at Uncontested or Contested Divorce Proceedings, we can help. We answer all queries within 24 hours.